The Fen is designed to be played without a GM, because it's more of a co-operative survival game than a roleplaying game. 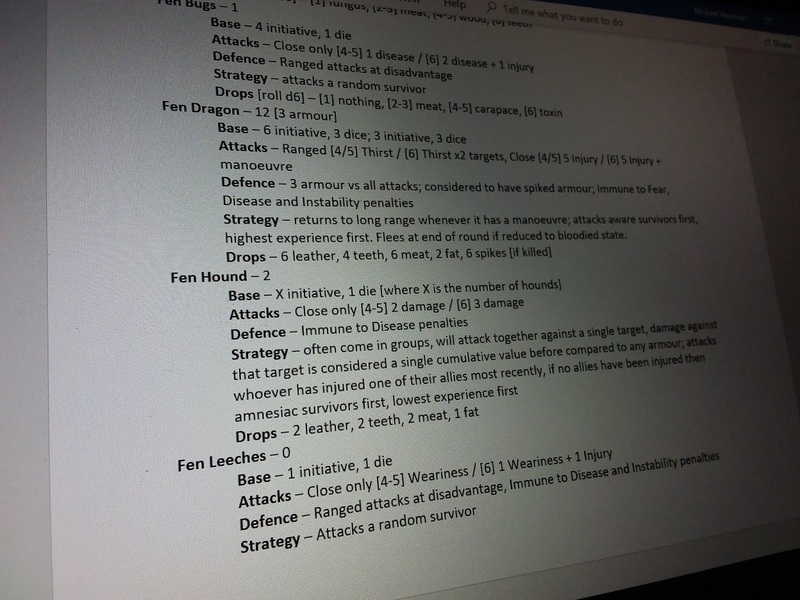 As a result it draws a little from the idea of Fighting Fantasy books, by having a procedural set of rules to define how opponents will confront the characters. I've tried to develop a few 'opposition AIs' in the past, and they always start getting a bit fiddly because I often try to incorporate too much into the decision trees defining how the system reacts to player activities. If anyone has good suggestions of how other games handle this sort of thing, I'd love to hear them. At the moment though, I'm trying to get the feeling where different types of adversaries confront the characters in different ways. This is handled by giving the various opponent types a specific attack output, and a few key points indicating how they work strategically. Some opponents prefer to use ranged attacks, some hunt in packs, some prefer a straight up fight. Basically, each adversary has an initiative value indicating when they attack in the round, and a number dice that they roll when it's their turn to attack. 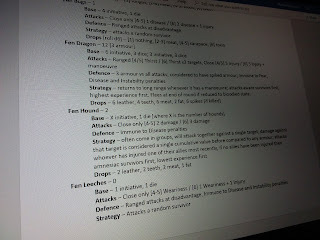 Then they get an 'attacks' description, indicating what effects their attacks have when they succeed with a roll of 4 or 5, or when they gain a high degree of success with a roll of a 6. If they have a ranged attack, it is mentioned here too. They get a 'defence' description, indicating any armour or protective features they might have, along with any penalties that attackers might have against them... for example, small opponents and flying opponents often causes ranged attacks to be at a disadvantage. A strategy entry indicates who this opponent tends to target among the player's side. This idea was drawn from the Star Trek CCG from the 90s, where different mission obstacles would indicate which members of the away team were targeted by any advantages or disadvantages. Perhaps the most powerful character is affected, perhaps the weakest, maybe a character with a specific trait, or maybe a character chosen completely at random. Among the strategy description, I also include escape clauses for the opponents because often they will not fight to the death, they'll just come in for a limited number of strikes before moving back into the shadows, or maybe they'll try to retreat once they've taken significant wounds. Kingdom Death did something similar to this, but its execution also felt clunky for a number of reasons. Finally, each opponent has the items they drop. In most cases, these items may only be scavenged if the opponent is actually killed, nothing is acquired if the opponent retreats or flees. I suspect that this is the kind of thing that will best be refined through a series of playtests. While I am generally gauging which opponents should be more powerful, and which should be less powerful, I'm not overly concerned with 'game balance' here, The Fen is a wild and unpredicatable place.